Niagara Falls Loves Families & Here’s 5 Top Reasons Why! The 20-acre Falls Avenue Resort is situated directly across the street from the incredible Niagara Falls and just steps away from the city’s top Niagara Falls Attractions. 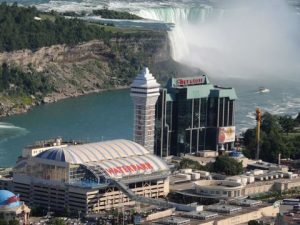 Falls Avenue Resort is located in the middle of Niagara’s lively tourist district with many resort attractions located right on Clifton Hill, the street of non-stop family fun. Falls Avenue Resort features more than 1,200 guestrooms and suites, many of which feature some of the best views of Niagara Falls. Each of the resort’s four hotels has been recognized with TripAdvisor’s Certificate of Excellence, and the Skyline Inn is a past recipient of the TripAdvisor Travelers’ Choice Award for Family Travel in Canada. Book a fallsview room and enjoy the spectacular fireworks from the comfort of your own room. Hotels are directly connected to Falls Avenue Resort’s many lively family entertainment venues, great family dining choices and located across the street from the Falls. The 3-acre Fallsview Indoor Waterpark offers non-stop fun for people of all ages with 16 waterslides, a 1000-gallon tipping bucket, giant wavepool, year-round outdoor activity pool, plunge bowl, sundeck, adult-only Jacuzzis, and much more. It has been named the TripAdvisor Travelers’ Choice Award Winner for Amusement Parks & Waterparks in Canada for three years in a row and is a waterpark experience unlike any other. Falls Avenue Resort has plenty of delicious dining options sure to please any appetite. Guests can venture into the wild at the Rainforest Café, experience a rock & roll haven at Hard Rock Café, dine with the stars at Planet Hollywood, or create an ideal meal from the many delicious culinary delights at the Fallsview Buffet restaurant. The options are endless and dining has never been so fun. 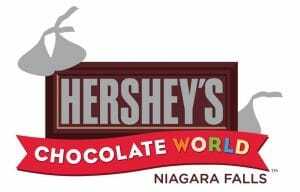 The Hershey’s Chocolate World Niagara Falls store is a chocolate lover’s dream come true. This 7,000 sq. ft. retail experience is the only store of its kind in Canada and features decadent fresh Hershey’s treats, packaged favourites and exclusive Hershey’s memorabilia. Families can indulge in chocolate dipped strawberries, rich milkshakes, creamy fudge, freshly baked cookies, and much more.